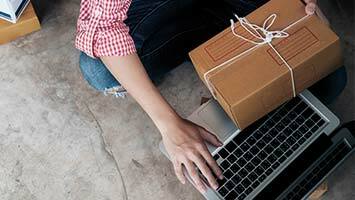 When starting out, selling online can seem daunting, but it doesn’t have to be. In fact, with a bit of planning and by following some tried and tested steps, you can have a successful online store up and running in no time! For those exploring the idea of selling products online but don’t really know where to start, we’ve put together this handy guide covering the basic concepts you’ll need to follow. These tips are relevant to selling on most major online marketplaces, such as eBay, and Amazon, Depop and Shpock. The first thing you need to do is get to know your product… inside and out. If you want your merchandise to sell successfully, you need to understand what you are selling, and who you are selling to. Having a commanding or technical understanding of your product – as well as being a must to providing competent after-sale support - comes across really well to customers in the decision phase and increases the trust factor in your listing; this is a sure-fire way to improve your conversion rate. Also, on e-commerce sites where higher funnel online shoppers can ask sellers questions relating to a potential purchase, providing knowledgeable and authoritative answers can be the difference between earning or losing that sale. Understanding what makes your product useful, desirable or valuable to a customer is imperative in successfully marketing it. Staking money on paid advertising channels comes with no guarantees of return on investment (ROI), and success hinges on your ability to efficiently identify and target the correct people – your likely customers. The more readily a potential customer-base can be identified, segmented and accessed via paid channels the more likely you are to see a decent ROI. Once you’re confident you have a desirable product and an audience to sell it to, you need to think about ‘setting out your stall’. As well as conveying a strong product image to those that directly visit or happen across your listing; to gain the maximum amount of traffic possible, you need to make sure your product organically appears in both marketplace and search engine results. Naming your product with a relevant title is vital for sales. Think about what people are going to be typing into a search bar or asking a smart assistant when searching for a product like yours. Research the keywords, and pepper your title with the most relevant, descriptive words with the highest search traffic. The more specific to your product your keywords are, the less competition you’re likely to have to rank for them. Done correctly, this simple step will help your listing rank for as many relevant search queries as possible and give your product the most organic exposure possible. Alongside your title, your product description is another great opportunity to embed the maximum number of relevant keywords – i.e. the terms online shoppers are most searching for with your product in mind - into your listing. On a massive marketplace like Amazon – or even using a primary search engine like Google –the autocomplete function in the search bar is a great way to expand your keyword base quickly and cheaply by getting suggested popular longtail keywords in your niche. Google’s keyword planner tool is also great for keyword research and gauging search volume of potential keywords – however, you need an active AdWords account to use it. When writing your description, outline your product in detail, including any technical specifications, sizes, colour variations and other information your customers may find useful. The more keyword-optimised, relevant info you add to your product description, the more likely your listing is to appear broadly in searches. The value for this exercise is twofold: first, it directs more new and relevant traffic to your page; second, it increases a customer’s trust in you as a vendor and in your product. A final simple yet important tip regarding your listing is to always spellcheck your work. It takes no time at all to proof your content and gives the consumer the right impression. 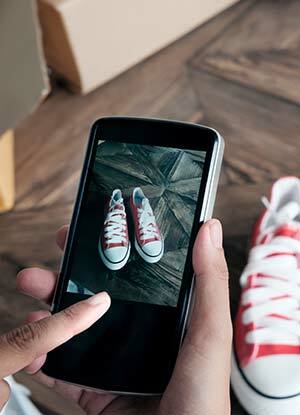 The marketplace you opt to sell on will likely have its own guidelines regarding product images – and familiarising yourself with these rules should be your first port of call. While the quality of your images isn’t expected to be flawlessly professional – especially on more informal ‘car boot sale’ style platforms – your images must conjure up both an accurate and flattering representation of the product you’re selling. If you have a good camera and feel confident, snap your product from numerous different angles, set against a white or otherwise neutral background and make sure all elements of your product are clear to see. If you have a little more budget to play around with, professionally taken and edited photographs or 3D renders will give your listing a real air of sophistication. According to research conducted by ecommerce platform Shopify, a product is judged by a potential buyer in just 50 milliseconds. In many cases, the image is the first and only representation of the listing that’s considered - ahead of its description, rating, reviews or tech specs. Therefore, having well-taken, eye-catching and representative images is a necessity to the successful marketing of your product. As with any purchase, the commitment to buy is usually determined by the price. Set a realistic price on your products which is competitive, but also one that will make you a profit. Search for similar products and see how much they are selling for. Consider undercutting your competition slightly to give you that initial competitive edge, which will help your business to be successful. Another cost to take into consideration is the seller fees you will have to pay. If you are selling small, cheap products, then the sellers fees can eat up a lot of your profit if your volume is low, so you need to factor this in to your sales forecasts. Get Reviews and Plenty of Them! If you’re selling on a highly competitive platform like Amazon or eBay, reviews can be a defining factor in getting your product sold amid competition from numerous similar listings. Having great product feedback from plenty of happy customers is a great way to stand out for the right reasons and catch a prospective buyer’s eye. According to the Spiegel Research Centre, 95% of shoppers read online reviews before making a purchase, while 72% of customers won’t even consider purchasing until they have read up on both the product and purchase experience by checking out a seller’s reviews. While the quality of reviews is an obvious factor in influencing a prospective buyer’s decision -the more demonstrable positive customer feedback the better - research equally suggests that a product with a significant number of reviews has a far greater purchase likelihood than the same product with no reviews. This means that, for your product listing to flourish, you not only need encouraging reviews, you need plenty of them. For a platform like Amazon, it is estimated that up to 90% of customers won’t leave feedback unless prompted, and those that do tend to use the review system as a way to vent their frustrations at a poor experience. Remind them to leave an endorsement, if satisfied with the experience. Make it easy for them by linking to the review page in the email! Give them an opportunity to express dissatisfaction to you directly. In most cases, your ability to pre-empt and rectify an issue at source will prevent what could otherwise have turned into a negative review. Just be careful to read your marketplaces terms of service regarding reviews ahead of time –you don’t want to be penalised for illegally soliciting reviews in large numbers with an overzealous after-sale strategy. By following these tips, you should be ready to start selling online. Remember, be competitive, honest, and be descriptive. Your new customers will like that!